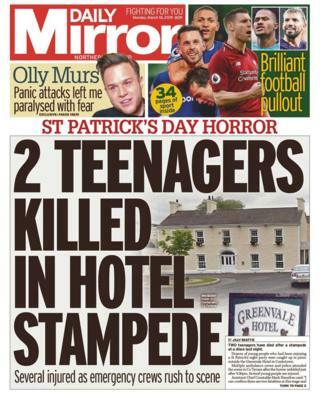 The deaths of teenagers outside a St Patrick's Day party at a hotel in Cookstown, County Tyrone, dominate the Belfast Telegraph and the Daily Mirror. The papers report that two people were killed, but a third death was confirmed early on Monday morning, after the newspapers went to print. The papers report that there was a "stampede" at the Greenvale Hotel. Paramedics, doctors and five emergency crews were dispatched to the venue at about 21:30 GMT. Beyond that tragedy, the News Letter reports that several speakers at a recent Brexit conference in Belfast have criticised Sinn Féin President Mary Lou McDonald for posing with an "England get out of Ireland" banner. Ms McDonald was photographed with the banner during the New York St Patrick's Day parade on Saturday. The newspaper says that nationalist unity has been "fractured" by the image, which was posted by the party on social media. It carries quotes from SDLP leader Colum Eastwood, Green Party leader Clare Bailey and political commentator David McCann, who all spoke at the Beyond Brexit event in January. Ms Bailey said posing with the banner "calls into question her genuine commitment to equality and rights". Footballer George Best is the best player of all, according to Sky Sports' Jeff Stelling. The News Letter had a conversation with the presenter during a visit to Windsor Park, who said he "can see why the atmosphere is so good" at the stadium. And there's a leaping leprechaun on the front page of the Irish News. The newspaper reports that thousands attended the St Patrick's Day parade in Belfast on Sunday. The Irish News also has a story about Ian Paisley backing a pay rise for councillors in Northern Ireland. The newspaper says the DUP MP wrote to Secretary of State Karen Bradley lobbying for her to give councillors a 50% pay rise. In the letter, obtained by the Irish News, Mr Paisley detailed proposals to increase councillors' basic annual wage from £14,485 to £21,727. The Royal couple enjoying "the black stuff" on St Patrick's Day also makes the news on the Daily Mirror, Belfast Telegraph and the News Letter. The Duke and Duchess of Cambridge toasted Ireland's patron saint with a Guinness at the 1st Battalion of the Irish Guards' barracks in Hounslow, west London.